Joint Chiefs of Staff Chairman Adm. Mike Mullen said the Marine Corps would comply with a "don't ask, don't tell" repeal. 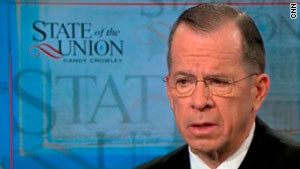 Washington (CNN) -- The head of the U.S. Marine Corps will fully cooperate with a repeal of the "don't ask, don't tell" policy barring openly gay and lesbian soldiers from the military, Joint Chiefs of Staff Chairman Adm. Mike Mullen said Sunday. In an interview on CNN's "State of the Union," Mullen said there was "no question" that Marine Commandant Gen. James Amos, an opponent of repealing the "don't ask, don't tell" policy at this time, would implement all necessary changes to allow openly gay Marines to serve if Congress passes a repeal measure. "He basically said that if this law changes, we are going to implement it, and we are going to implement it better than anybody else," Mullen said of comments Amos recently made at a townhall-style meeting with Marines. The U.S. Senate is expected to vote on repealing the policy in coming weeks. Several senators on the fence about the repeal have stated that they are waiting for a report by the military on the impact of a proposed repeal before they will make a decision. The House already has passed a repeal measure, and President Barack Obama says he supports repeal under a process worked out with Mullen and Defense Secretary Robert Gates that includes a review of what the change would entail for the military. The review is due December 1, though a Pentagon spokesman said Sunday the report could come in a day earlier. "Secretary Gates is pushing all involved in the Comprehensive Review Working Group's report to have it ready for public release on November 30th in order to accommodate the desire of the Senate Armed Services Committee to hold hearings as soon as possible," spokesman Geoff Morrell wrote in an e-mail to CNN. A federal judge has ruled the policy unconstitutional, and the case has been appealed to the 9th U.S. Circuit Court of Appeals in California.